Have you been watching the NCAA Basketball Tournament? I have. And one thought keeps going through my head; people love to win. This drive to win gets everyone so excited that there’s even a name for this phenomenon; “March Madness”. As in, very shortly I think we’re all going to succumb to this madness. Of course this is not a new idea, but it’s still noteworthy; precisely because it is innate in all of us. We all want to be important, to surpass others, to achieve distinction. Life plays out like an open competition and we’re all asking to be granted first place. On the surface, the design awards appear to fall in line with this notion; selecting and honoring only a few out of many. And in this manner, perhaps, they do satisfy certain individuals. But this is not why I believe design awards are important. For me they are not meant to merely applaud a specific firm or architect, but rather to create a platform for an exchange of ideas that advance the value of architecture. It’s these collective ideas that are significant; not the individual. To this end, designs entries are presented anonymously to the jury, so what’s being judged are the clear ideas of a specific project; not an architect. The design awards serve to recognize these new ideas, the avant-garde, the envelope pushing; and thereby elevate the profession of architecture. Each year the Design Awards Committee is charged with constructing the policy to acknowledge the best architecture in Austin. Three architects are selected from outside of Central Texas who are recognized as being at the forefront of the field; those who are adept at recognizing innovation and forward-thinking. This year we had one juror whose design focus is on large scale commercial and institutional projects, one who specializes in commercial interiors, and one whose practice is largely single family residential. This diversity is deliberate and serves to engage the jury in a fresh discourse on all building types. 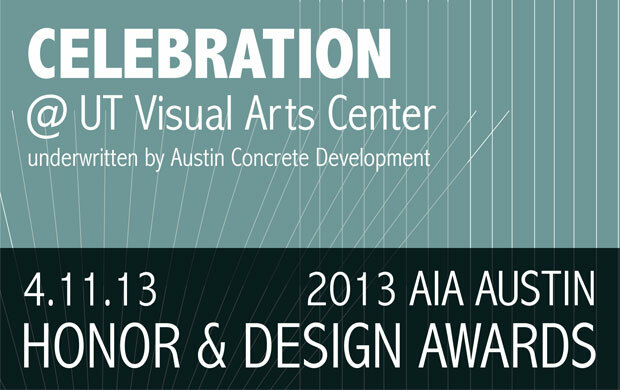 Given that the Austin design community is abundantly talented it is always a difficult task to select winners. As confirmed by the jury, this year was no exception. The Awards Celebration is the culmination of this annual process and serves as the public platform for the community to view the winning designs. This year the UT Visual Arts Center was chosen as the venue to further engage the design community. Selected galleries will be open during the reception to allow everyone the opportunity to view student work as well as an installation by Seattle based art & architecture collaborative, Lead Pencil Studio. So please come out on April 11th to support the Austin design community and to celebrate the projects on its leading edge. Purchase tickets to the Awards Celebration here.